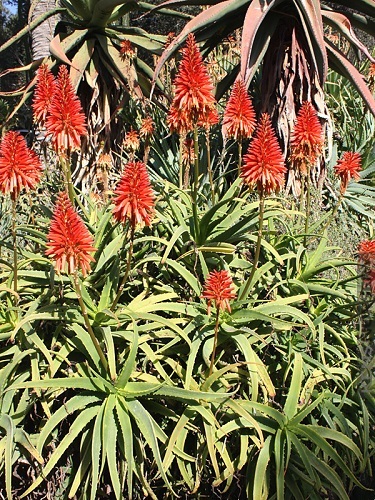 Aloe candelabra (Asphodelaceae) It is a synonym for Aloe arborescens. It can grow to 2m tall. The narrow, tooth-edged leaves which are 15-22cm long and 2cm wide, form a loose rosette on the end of a bare woody stem. Offsets normally appear around the base when plants are two or three years old. Red flowers may be produced at the top of a long branched stem. Sowing : Seeds germinate very well but may damp off if overwatered. Use a mixture of river sand, compost and soil to sow seeds in. Sprinkle the seeds evenly on the surface and cover with a layer of small pebbles. The pebbles help the seedlings to stay upright and prevent damping off. Keep seed tray in a dry warm corner and do not allow to dry out. Transplant the seedlings after one year. Location: Pietermaritzburg. Date of harvest: October 2018.